King Abdullah also set up a committee under the chairmanship of Al-Tuwaijri to complete necessary procedures and make required changes to implement the decree as well as to propose necessary changes to the Council of Ministers Law. The committee has to present its proposals to King Abdullah within six months, the decree said. Al-Tuwaijri, who holds the rank of a minister, has been asked to recommend names for top positions in the court. King Abdullah issued another decree, relieving Prince Abdul Aziz bin Fahd from his position as head of the court for Cabinet affairs, on his request. However, Prince Abdul Aziz will continue as state minister and Cabinet member, the decree said. 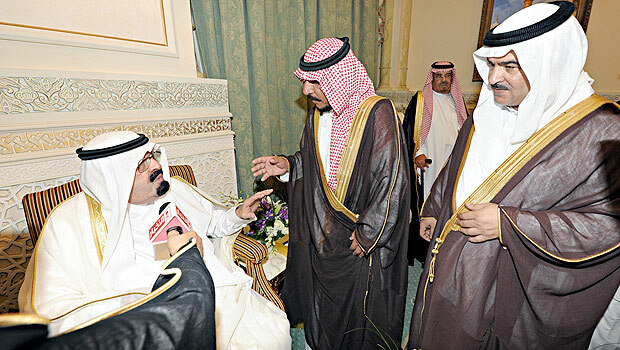 Meanwhile, King Abdullah received at his palace Fadae bin Nawaf bin Shuraim, Hamili Ali Al-Shammari and his brothers and close relatives who announced their decision to pardon the killer of their son Muhsin bin Ali Al-Shammari. The killer was Naif bin Hamdan Al-Shammari. "I am pardoning the killer of my son thanking God for your safe return to the Kingdom," said Hamili. King Abdullah thanked Hamili's family for the gesture and said God would reward them for their noble action. The reception was attended by top officials including Makkah Gov. Prince Khaled Al-Faisal.